The dwarf hutia was formerly found throughout Cuba, but it now occurs only on dry islets in the Zapata Swamp on the Zapata Peninsula in south-central Cuba. It has not been sighted since the 1930's, but it is believed to survive because its tracks and feces have been seen recently. The causes of the dwarf hutia's decline in the past included habitat loss through agricultural activities (including charcoal production) and predation by the introduced mongoose. 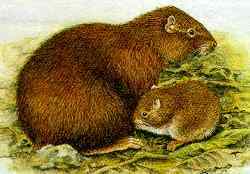 *** The dwarf hutia is the smallest of the hutias. The dwarf hutia was formerly found throughout Cuba, but it now occurs only in the Zapata Swamp on the Zapata Peninsula in south-central Cuba. 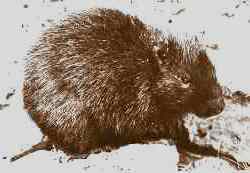 It has not been sighted since the 1930's, but it is believed to survive because its tracks and feces have been seen recently (Alvarez & Gonzalez 1991) . The causes of the dwarf hutia's decline in the past included habitat loss through agricultural activities (including charcoal production) and predation by the introduced mongoose. The dwarf hutia lives on dry islets in the Zapata Swamp. The dwarf hutia apparently has only 1 young per birth.